Historically speaking, cannabis has been used for a whole slew of tinctures, potions, and other such miracle cures. 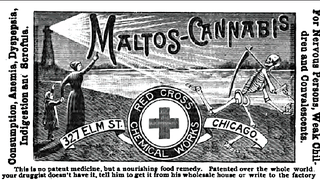 But for the "nervous persons, weak children, and convalescents" of the 1890s, there was Maltos-Cannabis, a nutritious weight-gaining supplement that set the consumer back a mere 75 cents a can. It's unclear how psychoactive this self-proclaimed "very best fattening food" and "excellent substitute for coffee, tea, and cocoa" actually was, but Maltos-Cannabis secured rave reviews from at least one medical journal. Interpret that as you will.